Last week BBC Four broadcast an excellent documentary on the Breguet "Marie-Antoinette" watch, introduced by the veteran entertainer Nicolas Parsons, now 92 years old and a life-long clock enthusiast. The programme is currently on i-player, but here are a few notes on Breguet and his remarkable watch. 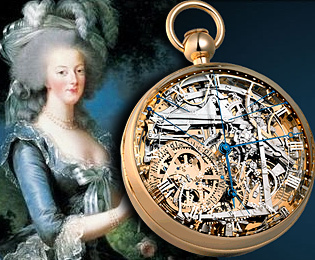 The "Marie Antoinette" is arguably the finest, most complex watch ever made and is currently valued in excess of $50 million dollars. It was commissioned from the great Parisian watchmaker Abraham-Louis Breguet in 1793 and was over forty years in the making. Some say the client was the queen of France herself, or perhaps her lover the Count Fersen. 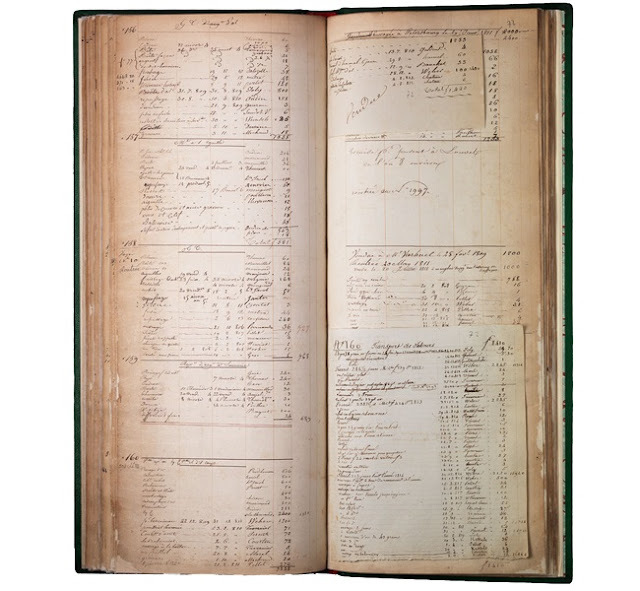 Details of the commission can be found in the surviving ledgers, kept today in the museum and archive which occupies the upper floor of the Breguet boutique in the place Vendôme. 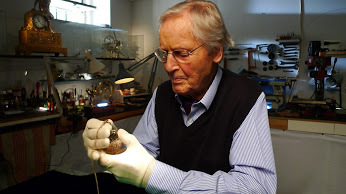 In the BBC programme Nicolas Parsons visits the museum in the company of the archivist Emmanuel Breguet, a direct descendant of the great watchmaker. In this clip Nicholas can be seen admiring the beautiful watches. Later the ledgers are reverently brought out of the vaults for him to view. 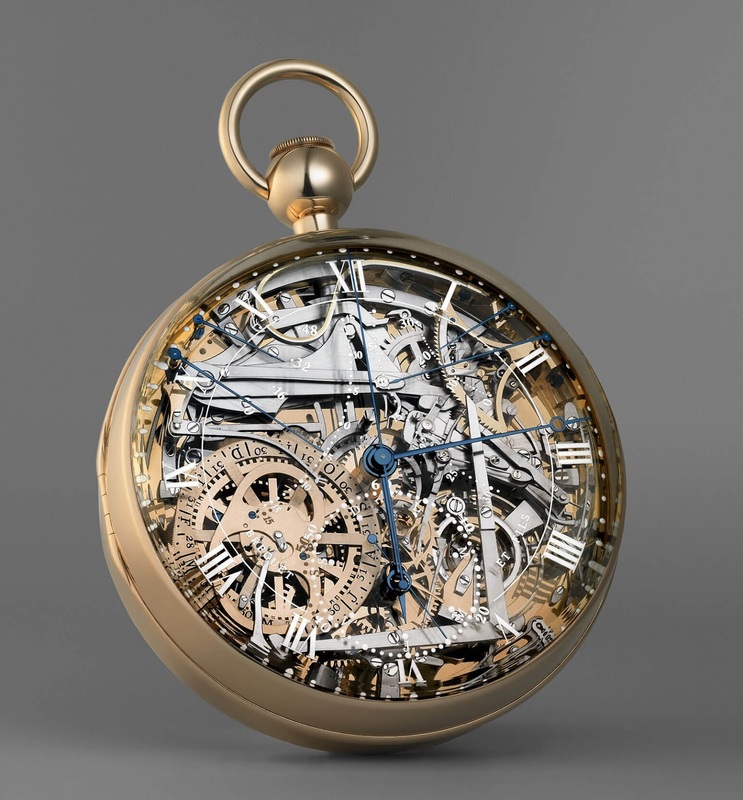 Breguet kept an enumerated record of every single watch or clock that he sold. On each page are the details of five or so pieces, with the names of the watchmakers who worked on them, plus the client, date of sale and the price. The 160th watch listed is the “Marie-Antoinette” . While most entries are a couple of lines, this commission covers a page and a half, with an extra leaf inserted, in order to record all the additional functions or "complications" incorporated into the design. Watch 160 was to chime the hours and the quarter hours; it should have a thermometer; it was to display day, date, month, years and even leap-years. It should tell solar time. Every bearing and roller, without exception, would be made of sapphire. It was to be as beautiful as it was ingenious. The commission specifically stipulated “all the complications possible and known be incorporated” ; “everywhere gold must completely replace brass” and, most striking of all, “no limit on time of manufacture or on price”. As Emmanuel Breguet points out the watch was a sort of super-challenge, requiring a “maximum” – both in design, technical achievement and aesthetics. 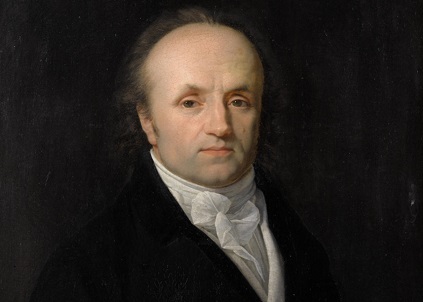 Breguet was to work on the watch intermittently for the remainder of his life. During the Terror he fled to Switzerland, taking the uncompleted watch with him; in 1812-14, with his reputation at its height, he worked obsessively. 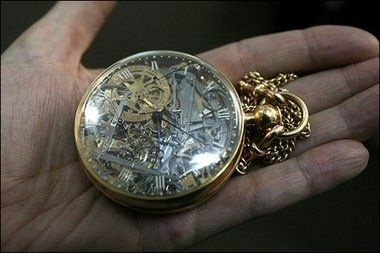 The watch was finally completed by his son in 1827, three years after Breguet's death. The modern history of the watch makes for good television. Having passed through various different hands, it was bought in the early 20th century by the industrialist David Salomons, whose collection was bequeathed to the Museum of Islamic Art in Jerusalem. In 1983, the museum was the victim of a spectacular "watch heist"; 106 antique watches, the "Marie Antoinette" included, were stolen by a lone thief with only the most basic of tools. No sign of the watches was found until 2009 when, quite unexpectedly, the haul was restored to the museum. The Tel Aviv antique dealer, called out to give a valuation and overwhelmed by the unexpected sight of the lost treasures, is particularly splendid; he is surpassed only Nicolas Parsons himself who, at the end of the programme, finally comes face-to-face with the magnificent watch. Who really commissioned the Marie-Antoinette? This, of course, is the big question. The BBC skirts over it lightly, perhaps in deference to the current Bregent / SWATCH company who have used the Marie-Antoinette connection extensively in their branding. However, the detailed evidence can be found in a scholarly study by the Belgian expert Bernard Roobaert, which has been made freely available (in French and English) on ISSUU. Bernard Roobaert, points out that, at 62 centimetres in diameter, No.160 is surely a gentleman's rather than a lady's watch. There is no mention of Marie-Antoinette (or the gallant Fersen) either in the Breguet archives or in records associated with 19th-century exhibitions of the watch. The first reference appears in the work of Sir David Salomons, who found Marie-Antoinette mentioned on the label of the watch when he bought it in 1917; the owner of the shop was French born antiquarian and jeweller Louis Albert Desoutter. Salomons himself remained cautious - the watch was "known as the Marie Antoinette" or "said to have been made for Marie-Antoinette" - but from this point on the association became established in the literature. What are the alternatives? The Breguet scholar George Daniels argued that No. 160 was not in fact a commission at all, since no limitations of time or price were imposed. However, there is evidence to the contrary. This watch was ordered from Abraham Breguet around 1783 by Monsieur de la Groie, officer of the guards of Queen Marie-Antoinette [...] A. Breguet started the work and the watch was almost finished when the Revolution broke out; Monsieur de la Groie emigrated, Breguet [...] fled to Switzerland in 1793 where he remained a few years during which the work on this piece was interrupted. When he came back, the work started again and the watch was finished in 1798; Monsieur de la Groie had died and Breguet kept it. Later on, general Junot, Duke of Abrantes, wanted to buy this piece, but he died before entering in its possession, and it remained finally to Breguet and became the property of his family after his death. This chronology does not quite add up. 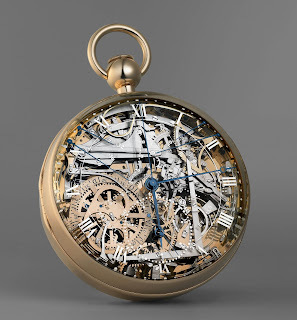 A repair note for the watch survives from 1838, which implies that at some time after 1827 when it was completed, it must have passed from Breguet's possession. The owner at this time is clearly specified: "M(onsieu)r le M(arqu)is de Lagrois à Provins. Sa montre Perpetuelle à repetition no 160." There have been various suggestions as to who Monsieur de la Groie / the marquis de Lagrois might be. Bernard Roobaert has a detailed argument pointing to the marquis de la Croix de Castries and his son who was in command of the garrison at Provins in the 1820s. The chronology fits well, though the corruption of La Croix into La Groie is a bit of a stretch. Whatever the identity of the client, however, we still have no evidence about the motivation behind the commission. House of Breguet website. Montres Breguet are currently sponsoring a Marie-Antoinette exhibition in Tokyo. Breguet au Louvre (website) - resource created for the Breguet exhibition which took place at the Louvre in 2009.